Working from home has significant benefits for Melinda Williams. 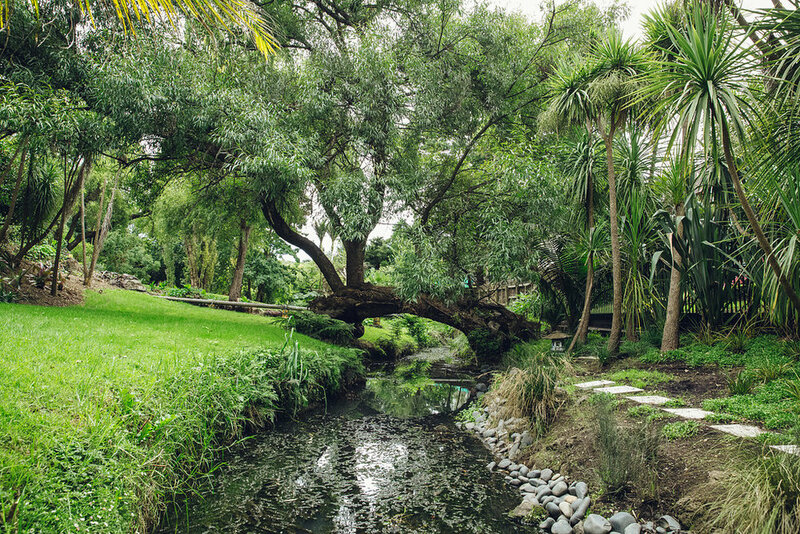 As PR manager for Boutique Brands including Oribe, Davines, and R+Co, her tranquil bush setting in the Eastern suburbs of Auckland, is also a retreat to raise a family. 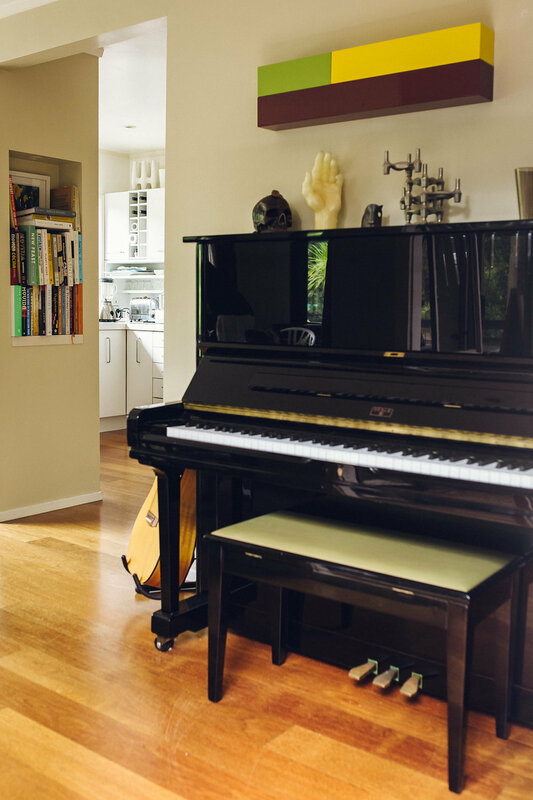 With partner, Greg Murrell owner of Ryder Salon, and their super cute toddlers Rafe and Manon, Williams took editor Trudi Brewer on a tour of their eclectic, sprawling 70’s home. What’s a typical working day for you? Few days are the same. But most weeks involve fulfilling media requests, meetings with editors, bloggers and influencers. Planning and executing send-outs or launch events for new products. Creating content for social media and websites, investigating sponsorship opportunities and helping develop brands strategies. 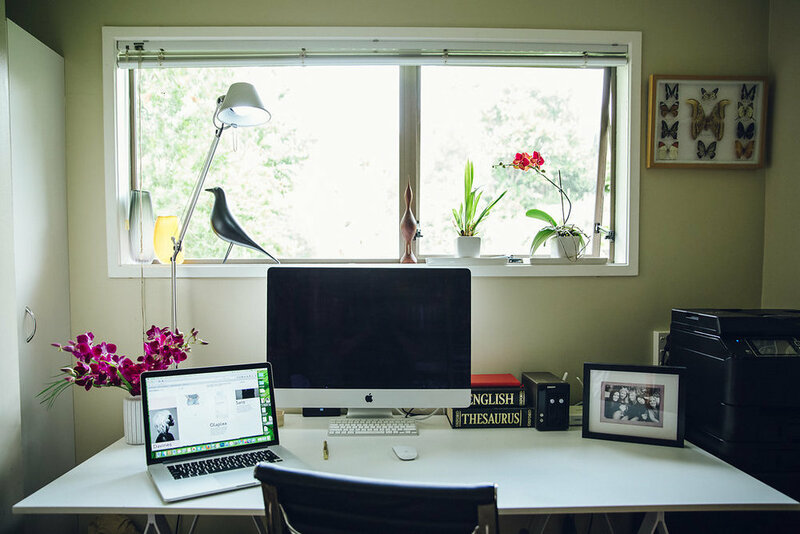 What do you love most about working from your home? It’s wonderful to be able to work so close to my kids while they are both small (we have an in-home nanny for the three days that I work). A 10-second commute to my home office is awesome. What advice do you give other women, juggling a young family and career? I find minimising daily decisions is essential. I plan the week’s meals in advance on a Saturday; we have a strict morning and evening routine; I plan my week every Sunday evening, and I have a capsule wardrobe of items that I love and that all go together. It probably sounds pedantic, but I find it gives me a clearer head and higher creative energy when I don’t have to spend time every day thinking about what to wear, what to have for dinner, and what jobs to tackle. What is the one thing that is not negotiable when it comes to your career? I’ve been a journalist and editor most of my working life and didn’t think I would go into PR as editorial integrity is very important to me. I couldn’t work for a company with ideals or products I didn’t believe in. Fortunately, the brands we represent are ones that I used and loved well before I started working here, so I can present them with conviction. How do you stay balanced and happy? Balance is honestly really hard to achieve with two small kids. Having a supportive partner is invaluable, and Greg and I try to give each other regular breaks, nights off to go out or follow our interests. I’ve had to learn to stop thinking: “When X happens I’ll be able to do Y” because every stage seems to bring new challenges. If I feel like I need more or less of something in my life, I have to find a way to make it happen now, rather than waiting for the time to be right in the future. What’s your ideal way to steal some ‘me time’? I love to read, so creeping away somewhere quiet with a book - especially when I can read uninterrupted for two or three hours - is the most relaxing thing I can do. For me, the things I find truly beautiful are always challenging, even uncomfortable. ‘Pretty’ is familiar, comforting, conventional, acceptable. ‘Beautiful’ is idiosyncratic, raw, awe-inspiring, or idealistic. Some things are both pretty and beautiful. A sunrise is pretty because of the aesthetically pleasing colours. But it’s beautiful because it’s a transitory moment that gives us a heightened awareness of the passing of time and our smallness in a huge universe. What products are always in your makeup bag? I love multifunctional products, like Jane Iredale cheek and lip stains, or the M.A.C Veluxe Brow Liner. Most of my makeup is Jane Iredale as I have very sensitive skin, and their products are completely non-irritating. And, which hair products do you rely on? As a base for healthy hair, a weekly Olaplex treatment is a must. I apply it on a Sunday night and wash it out Monday morning. It has fundamentally changed the look, feel and texture of my hair. Day-to-day, I love Davines Essential MELU Shampoo and Conditioner, which is ideal for long, fine hair, and a few drops of Davines OI Oil to keep everything smooth. If I have a special event to attend, I prep with Oribe Signature Shampoo and Conditioner, apply R+Co Park Ave Blowout Balm and Oribe Maximista Thickening Spray. I then blow-dry, and blast with Oribe Dry Texturising Spray for control and some movement. 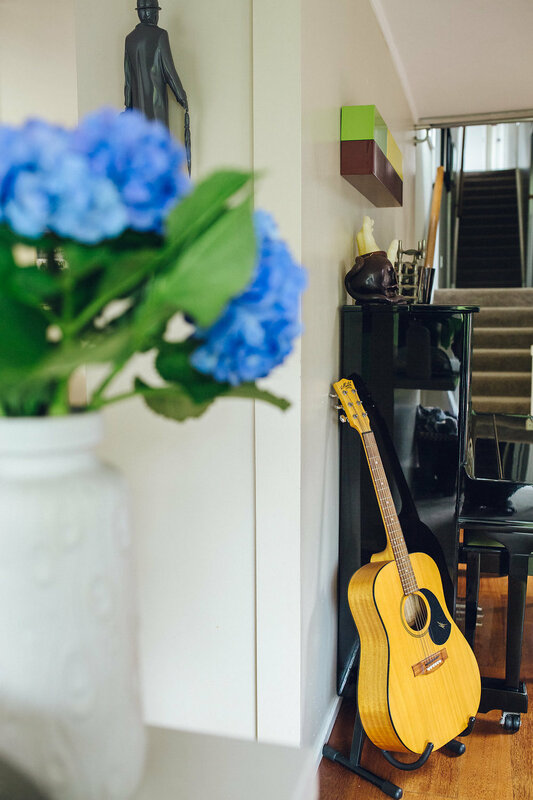 How would your describe your home? 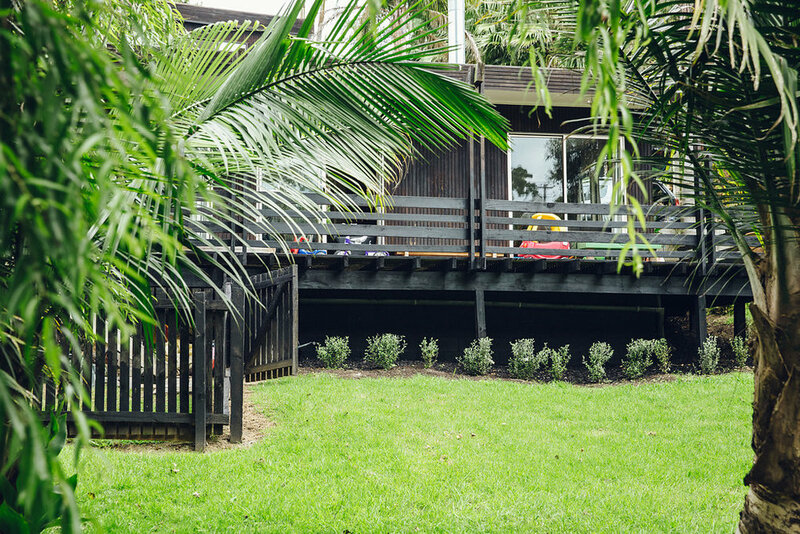 I grew up in a home that was quite similar to this one - 70s contemporary, flat roof, dark weatherboards, split level, big garden - so it has felt like home from the first time I stepped inside. I had a very happy childhood, creative, calm and close to nature, and I want to recreate that for my kids here. I love early mornings on the deck with coffee, listening to the stream and the birds in the trees. You have some interesting collectables, where did you find them? Most of the German pottery and Italian glass, has been collected by Greg over many years from vintage stores or online collections. Other pieces have been picked up in geology shops, design stores, at auctions or on travels, or have been gifts from friends. Both of us are insatiable book collectors and visit Unity Books on a weekly basis. Where would you send women for 70’s home inspiration? There’s a wonderful book by Jeremy Hansen called Modern: New Zealand Homes From 1938 to 1977 that showcases some of the best modernist 60s and 70s contemporary architecture and interior design in the country. All the local design inspiration anyone could want is in that book.